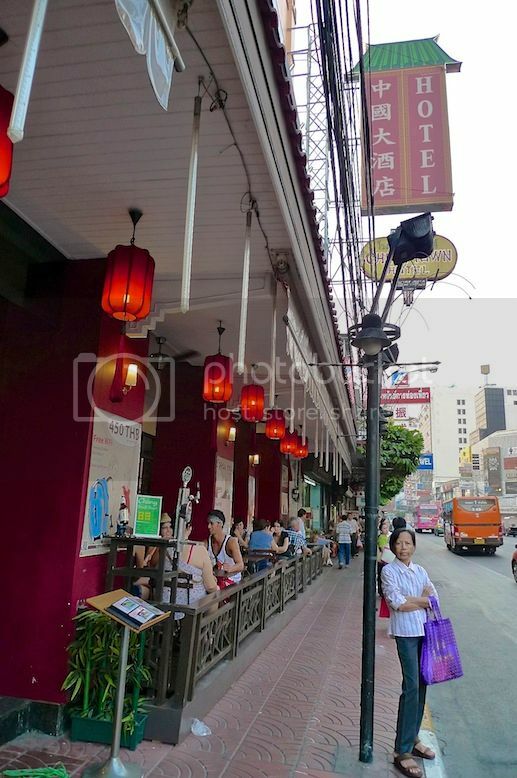 After searching around Yaowarat Road in Bangkok's Chinatown for our dinner, Ishmael and I settled on R & L Seafood Restaurant located at Soi Texas (also known as Soi Phadung Dao). I have no idea why they called it Soi Texas, but the interesting thing is on one side of Soi Texas is the Red Shirts while on the other (directly opposite) is the Green Shirts. Yes, two rival seafood restaurants battling it out - T & K Seafood (Green Shirts) vs R & L Seafood (Red Shirts). Both restaurants were crowded with people. So which to choose? We chose Red Shirts. No particular reason. I just felt more comfortable with red color. LOL! Although there were air conditioning inside the restaurant, we chose to sit outside al fresco style by the street side. As you can see, the waiters all wear red colored shirts, hence the name Red Shirts. 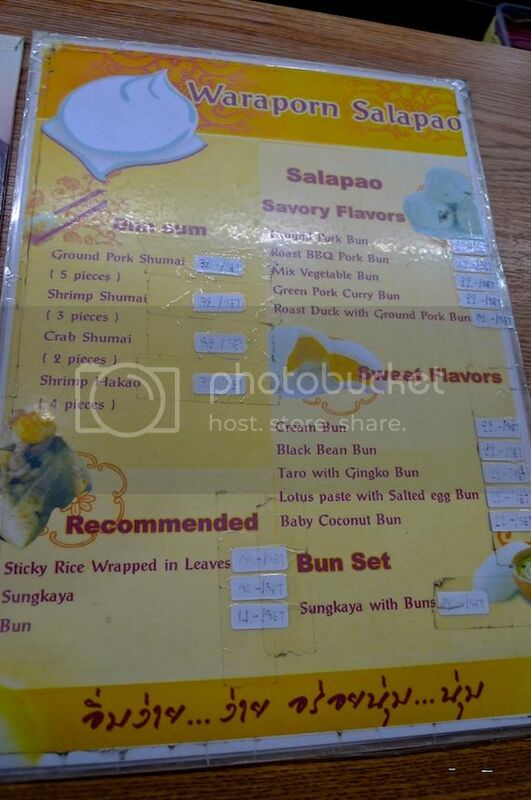 The menu is tourist-friendly as it comes in both Thai and English language with pictures of the food, so choosing what to eat here poses no problem at all. As there were only two of us, we could not order too many dishes. This is one reason why I prefer to go in a big group for dinner. (but only for dinner, or lunch - definitely not for sightseeing). 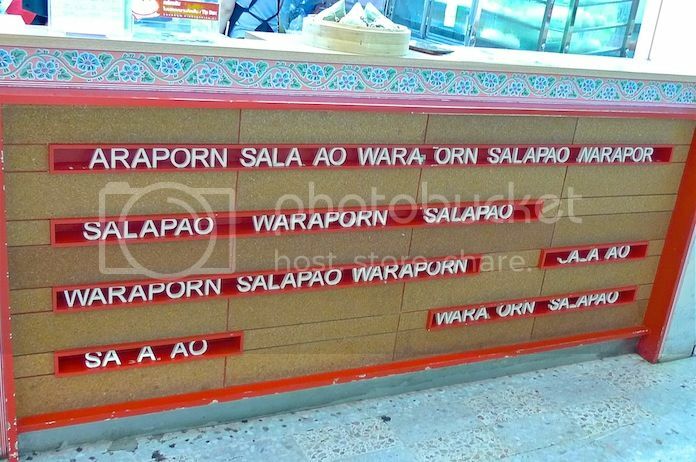 In this way, we can order more and try all the different dishes. Anyway, we ordered these grilled prawns. 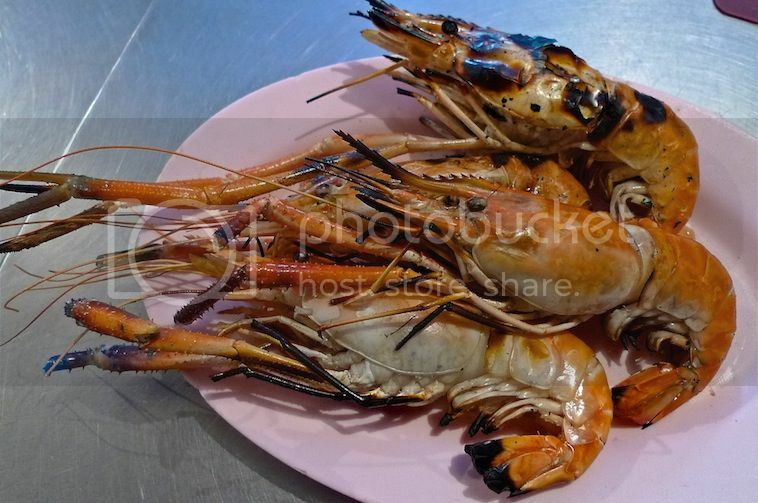 The prawns were big and the meat were so fresh and springy! We dipped the meat into the two different sauces provided. Simply lip smacking! 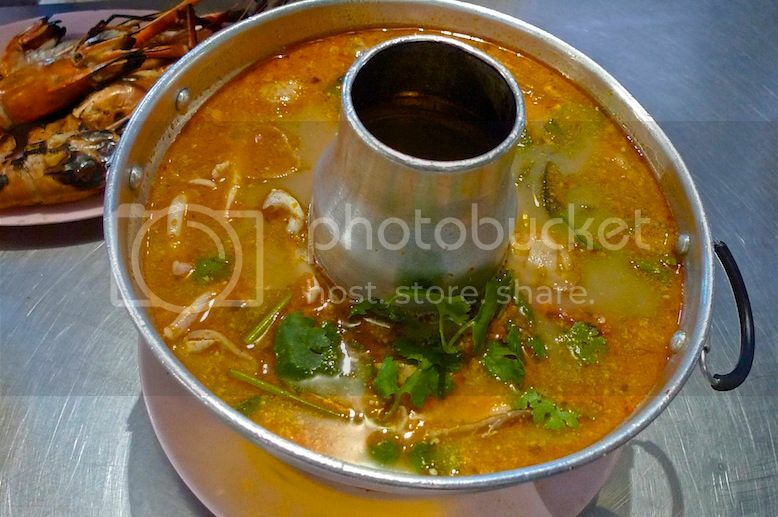 We also ordered a bowl of rice each and the tom yum goong mix. 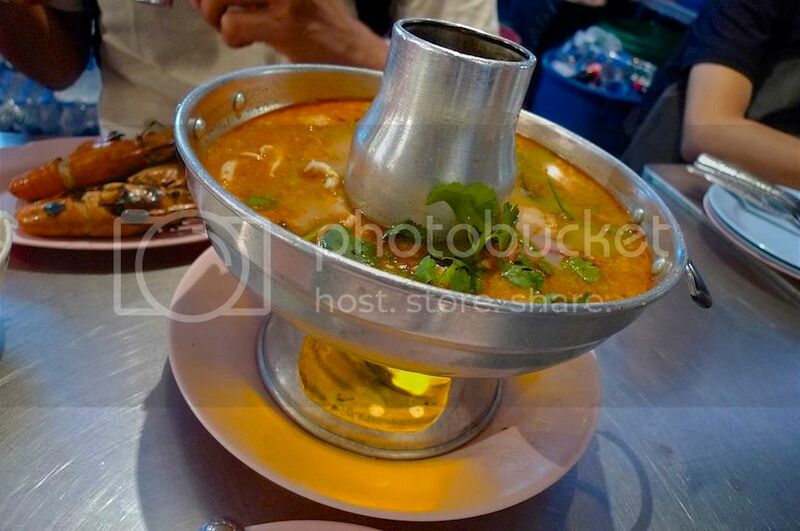 The tom yum goong was delicious with squids, prawns, fish and other seafood inside what looked like a steamboat. 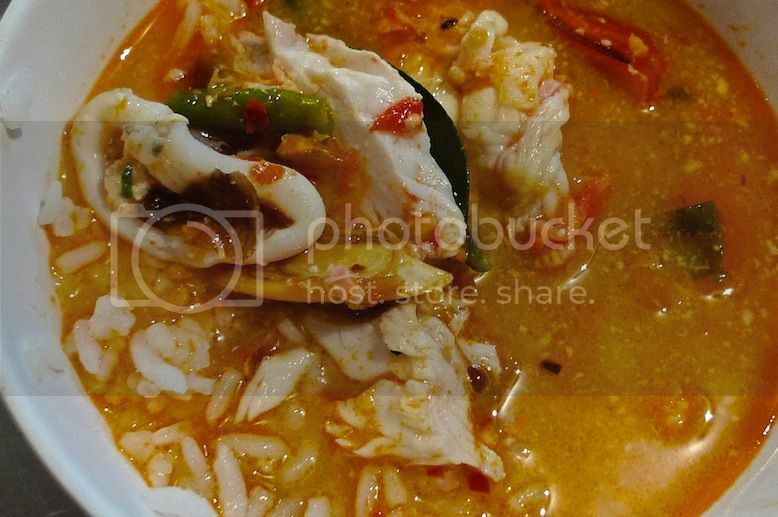 I even filled my bowl of rice with the tom yum soup and its ingredients! So yummy!! I had wanted to order those tasty grilled prawns again but I decided not to as I felt pretty full already. 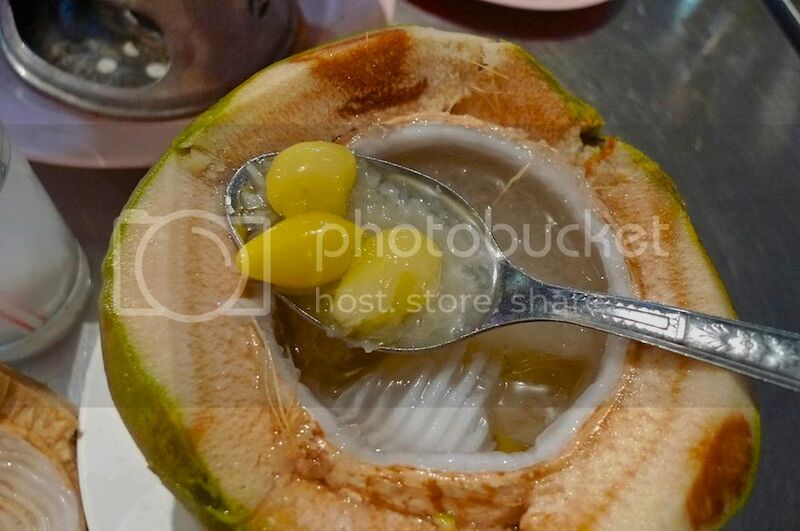 Besides we also ordered a dessert each in the form of bird nest - gingko in coconut. 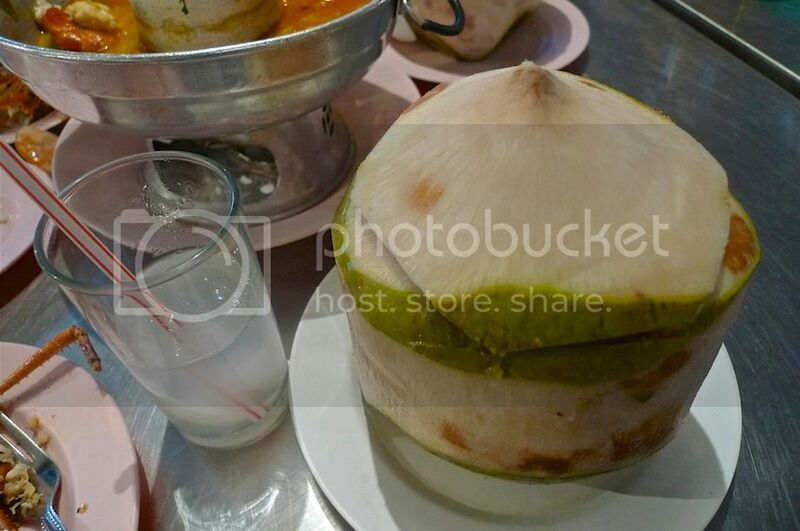 Since the coconut itself was filled with bird nest and gingko, the extra coconut water was placed in a separate glass. This dessert was delicious! I had no regrets eating here. 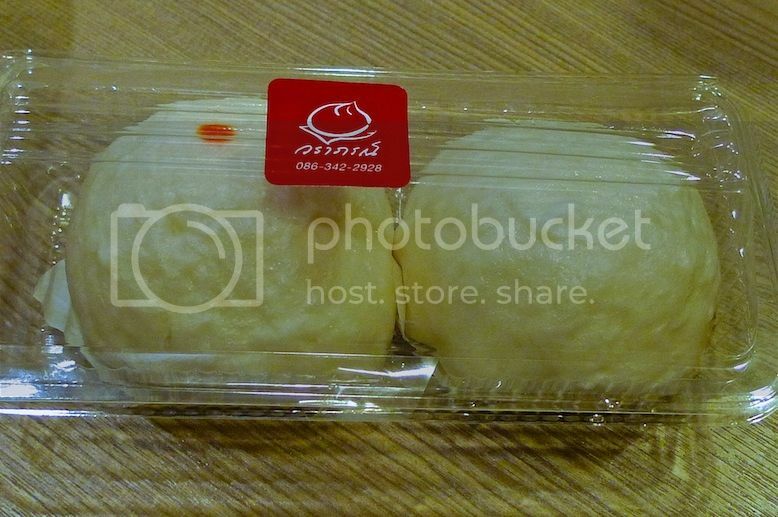 The food were fresh and of high quality and the price was reasonable. 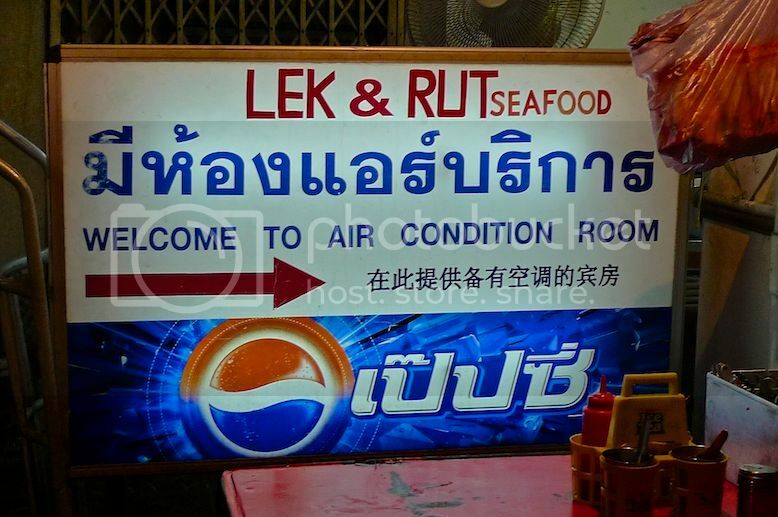 By the way, R & L actually stands for Rut & Lek. 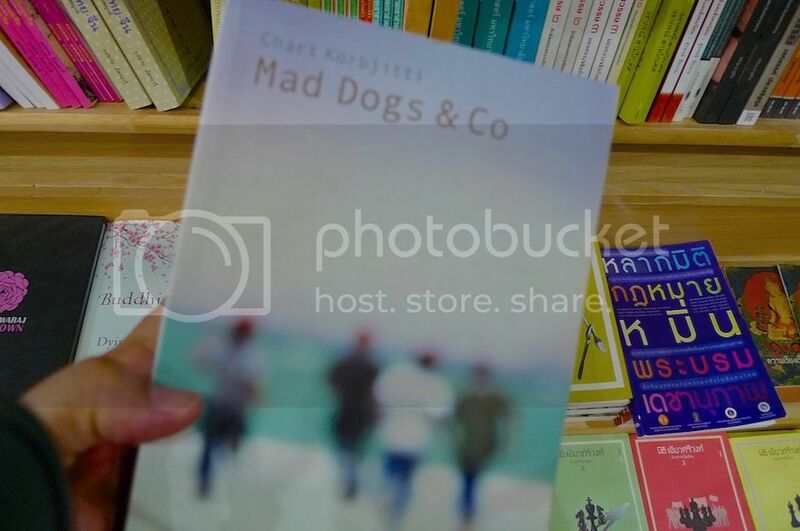 Directions : From Ratchawong Pier (N5), walk along Ratchawong Road, until you reach Yaowarat Road, turn right and walk for about 10 minutes. 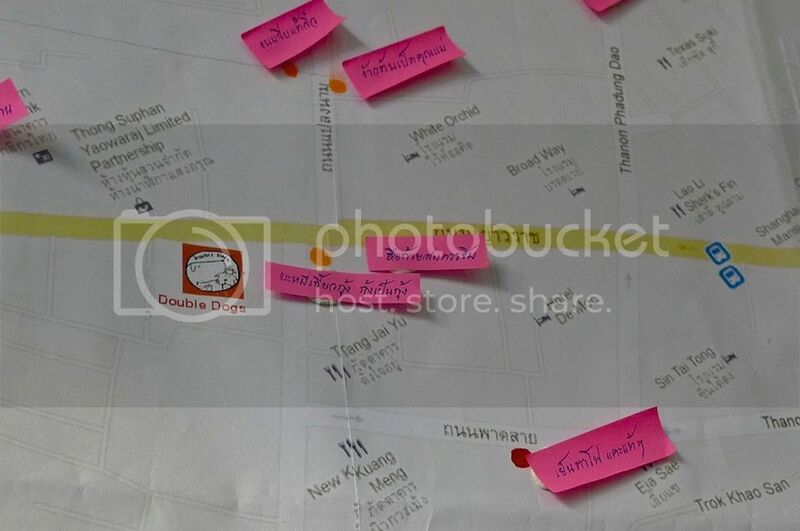 R&L Seafood (and rival T&K Seafood) is located on your left, at a street corner intersection of Soi Phadung Dao (Soi Texas) and the main Yaowarat Road. After our late lunch at Double Dogs Tea Room, my Filipino blogger friend Ishmael and I went for a leisure stroll along Yaowarat Road. I think it was about 5pm when we left Double Dogs, so we were also thinking of looking for a good place for dinner. 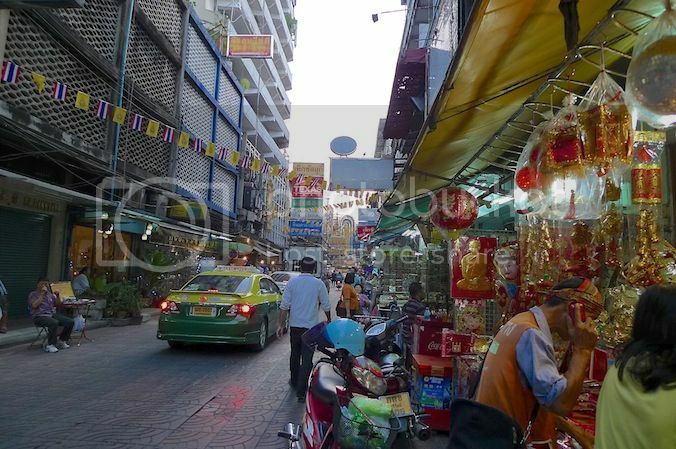 Yaowarat Road is part of Bangkok's Chinatown that covers a wide area including Charoen Krung Road, Songsawat Road, Mungkorn Road and more. 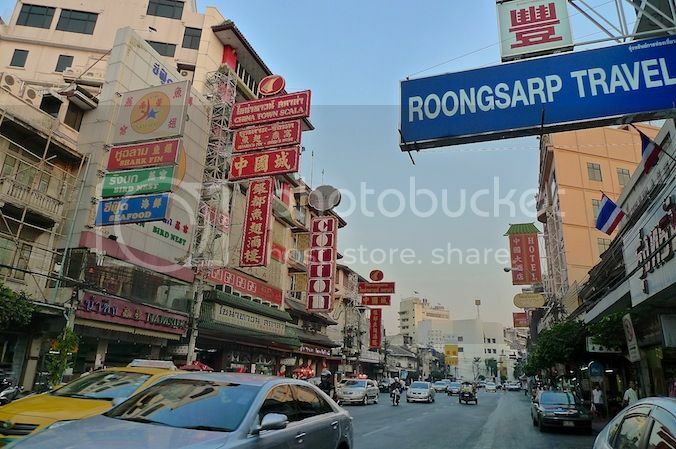 Yaowarat Road is very long and has the shape of a curvy dragon, thus it is not surprising that many Thai-Chinese businessmen set up shops here due to the good feng shui. 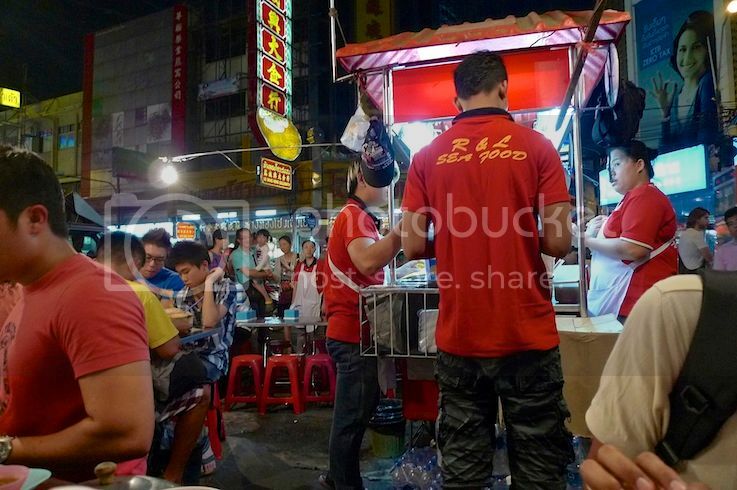 It is well known for its wide variety of food and turns into a large food street at night, attracting locals and tourists alike. 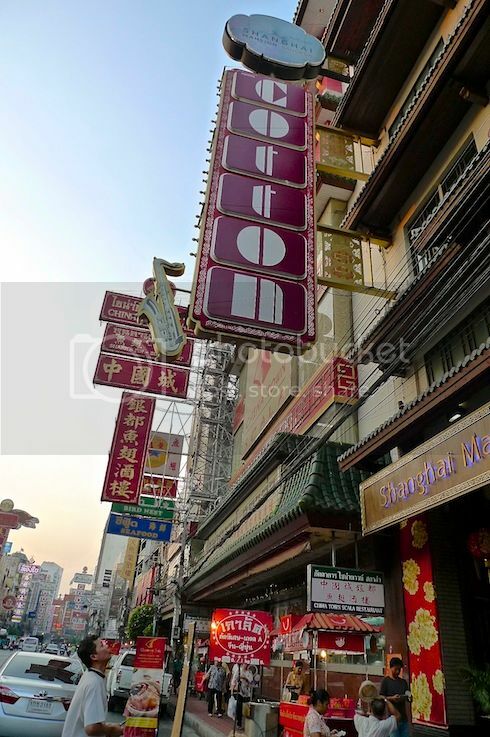 We walked past this China Town Scala Restaurant which specializes in sharks fin. No, we did not go in. 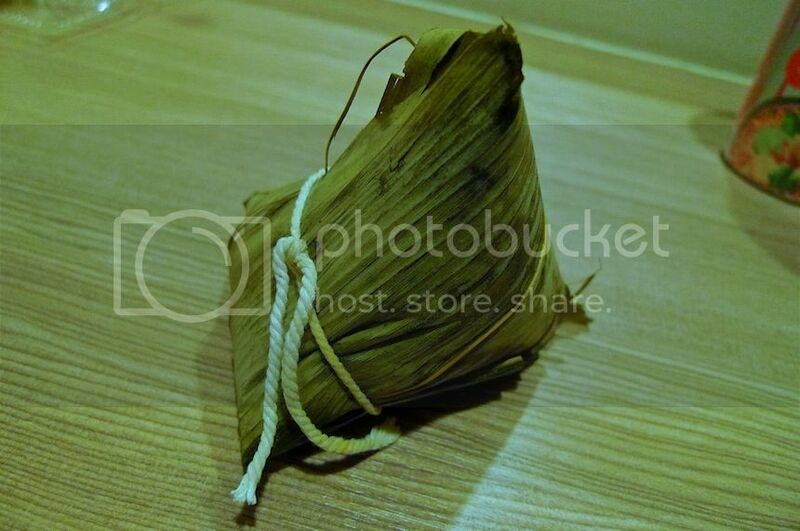 I can just imagine people throwing hate comments at me if I were to blog about eating sharks fin LOL! Next to Scala Restaurant is the Shanghai Mansion hotel and the Cotton Jazz Bar which I heard is pretty popular during the night. Maybe I will visit this jazz bar next time I return to Yaowarat. 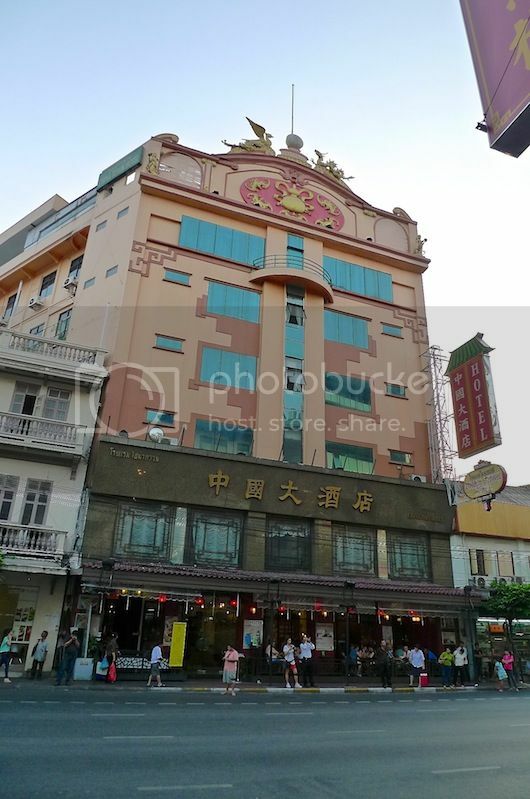 We also walked past this China Town Hotel with its unique roof. Fancy staying in this hotel? 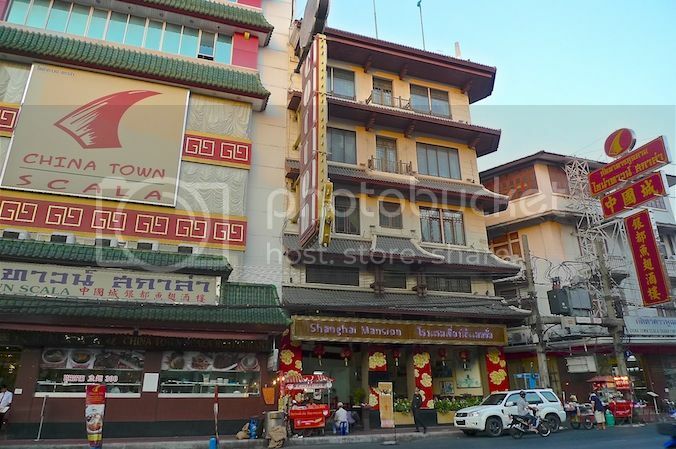 Perhaps it's a good hotel to stay in if all you wanna do in Bangkok is to enjoy the gastronomic feast in Chinatown from morning till night. 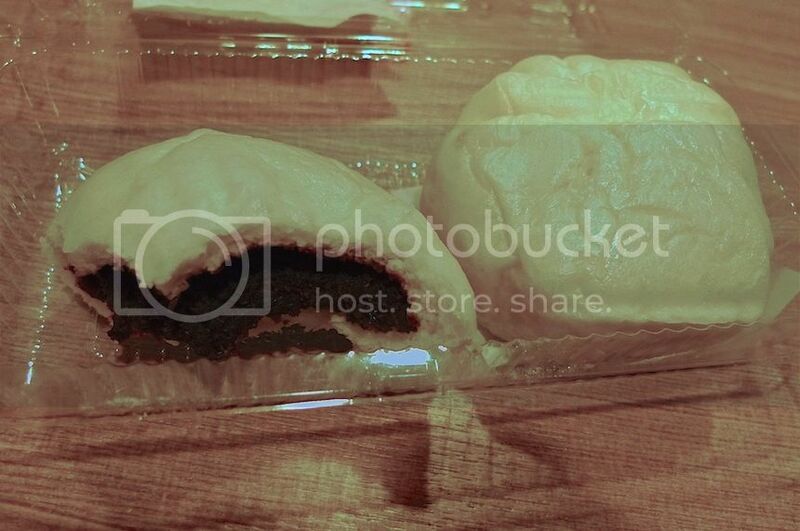 In fact, staying in a hotel in Chinatown is a wise decision if you plan to eat till wee hours of the morning! 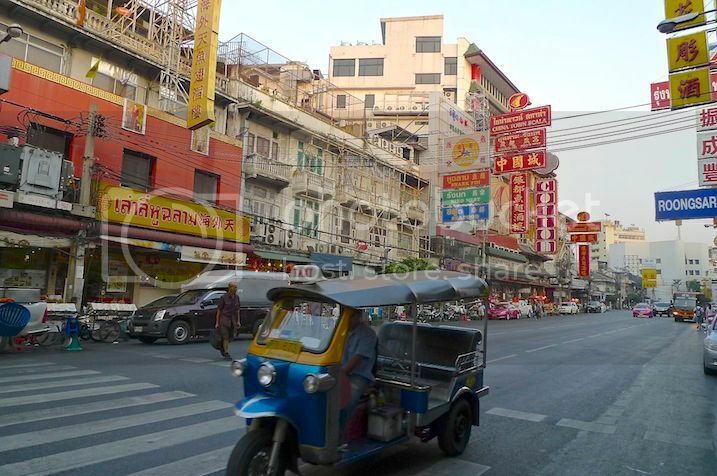 Although we walked mainly along Yaowarat Road, sometimes we would veer off to other smaller roads or lanes. 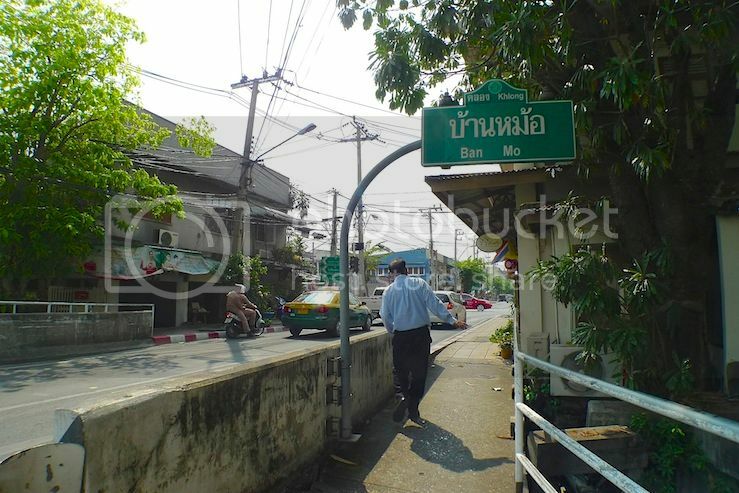 Can't remember which lane this was, but I think we were here trying to search for a shop selling khao moo daeng or red pork with rice. Unfortunately, we were unable to find it. 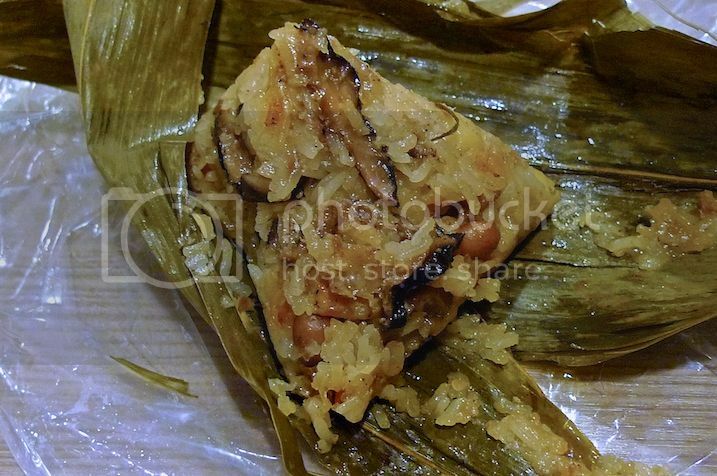 Anyone knows a good eatery selling red pork rice in Bangkok's Chinatown? Do let me know please. 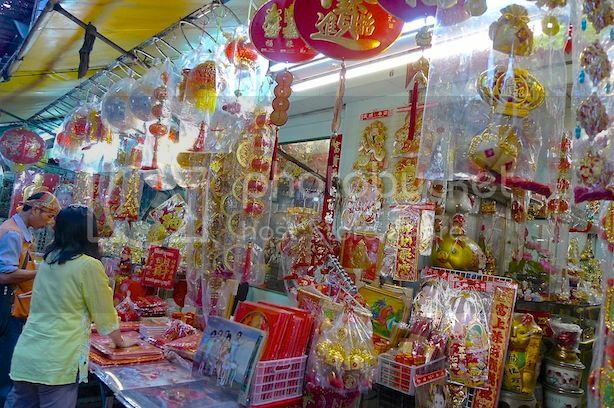 Instead, we came across this shop selling Chinese decorations and lucky charms. Now that's very characteristic of Chinatown! 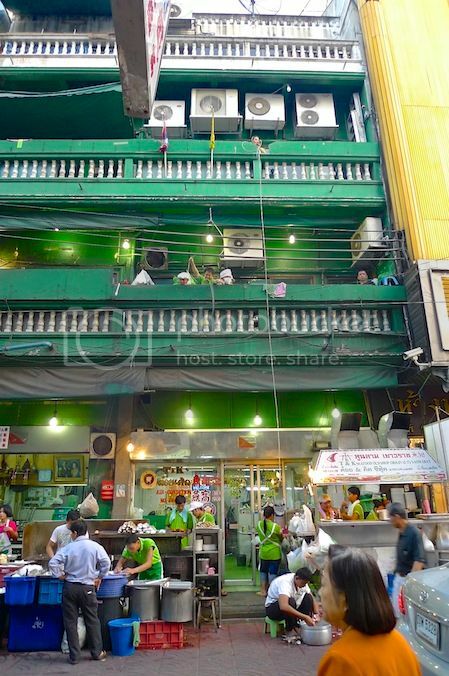 We did not have time to visit the famous Sam Peng Market but I will most likely do that the next time. 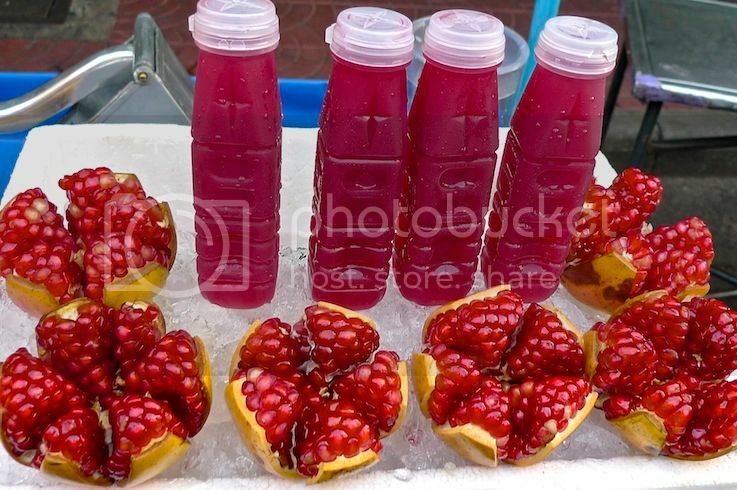 We passed by a stall selling fresh pomegranate juice and I just had to get one bottle! 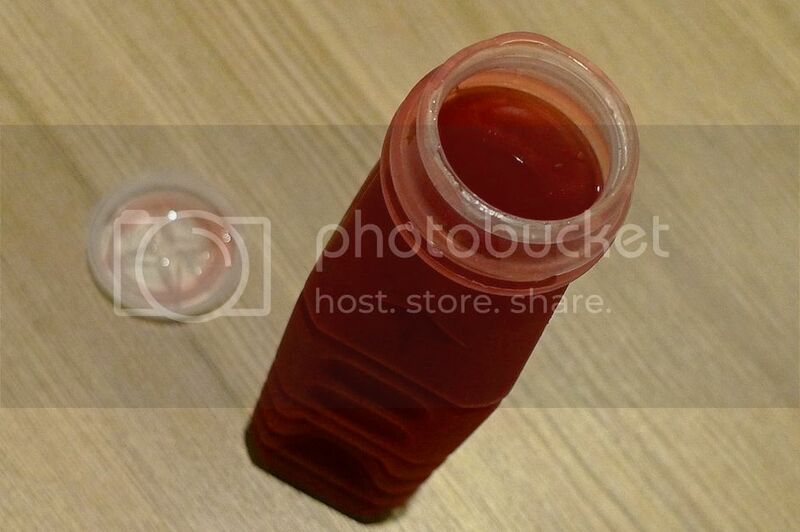 Still remember I drank the pomegranate juice when I got back to my hotel later that night. So delicious and refreshing! Should have bought two bottles instead. LOL. 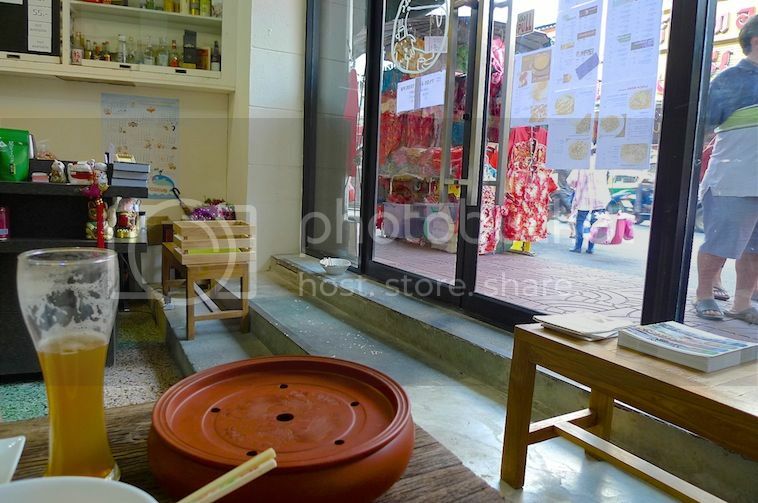 We also passed by this corner restaurant which is very famous in Yaowarat. It's known as T & K Seafood Restaurant. Notice all the workers here wear green shirts? They are sometimes known as "The Green Shirts". The restaurant is several floors high and I noticed that the workers actually use a pulley system to deliver the food instead of walking up and down the stairs! At first, I thought of eating my dinner here but then I later changed my mind and decided to go to their rival "The Red Shirts" which is just opposite! Did I make the right decision? 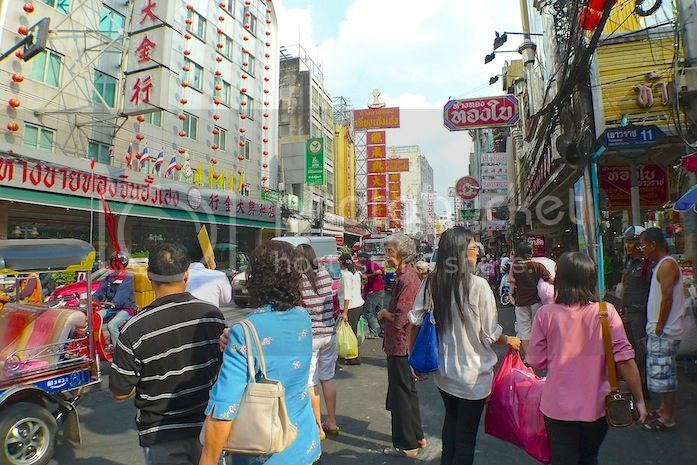 It was my first time visiting Yaowarat Road famously known as Bangkok's Chinatown. 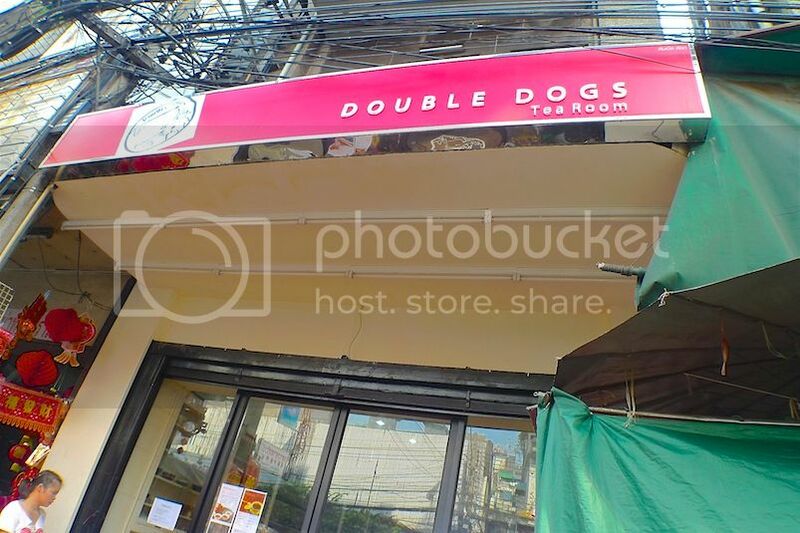 My Filipino blogger friend Ishmael Ahab and I had been searching for this place called Double Dogs Tea Room along Yaowarat Road. What a relief when we finally found it! We were hungry and thirsty after climbing up that amazing Wat Arun prang earlier in the morning. 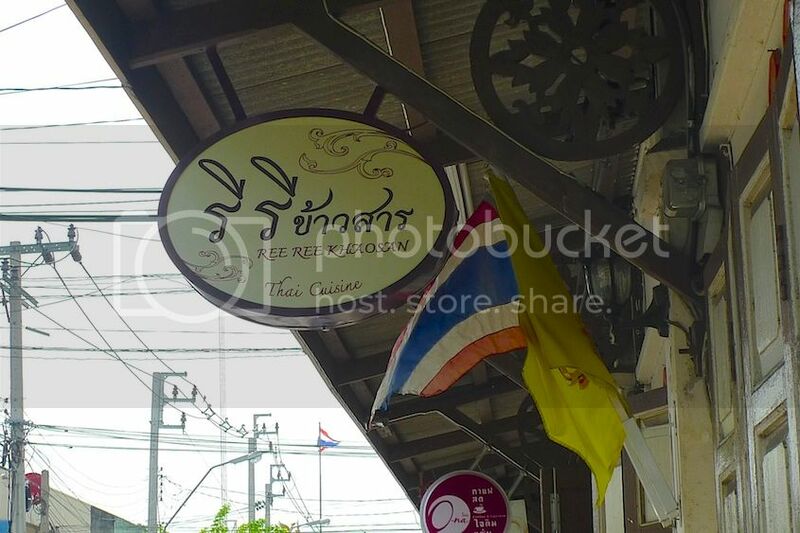 My initial plan was to have our lunch at an eatery called Ree Ree Khaosan nearby Wat Arun. 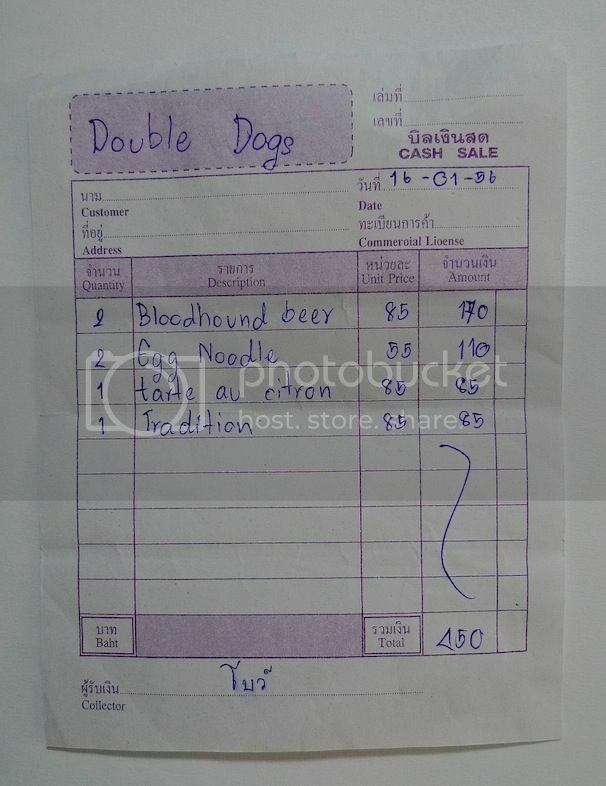 But we ended up having our lunch at Double Dogs in Bangkok's Chinatown instead. From Wat Arun, we walked to locate Ree Ree Khaosan. 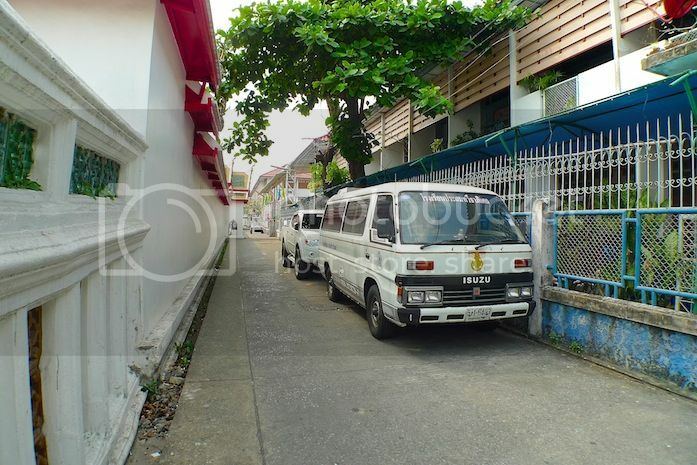 This is the small lane behind Wat Arun we passed through on the way. After walking a short distance, we reached this area. 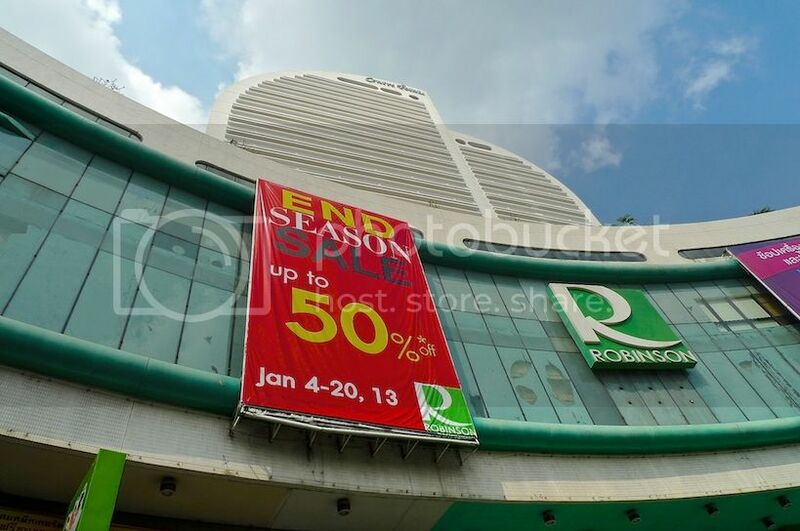 I spotted the Ree Ree Khaosan signboard in front and was excited! Unfortunately, to my greatest disappointment, the eatery was closed! NO!!!! Not closed down, but just closed for the day. Or perhaps closed during that hour, although that would be weird as it was lunch time. Well, what to do? 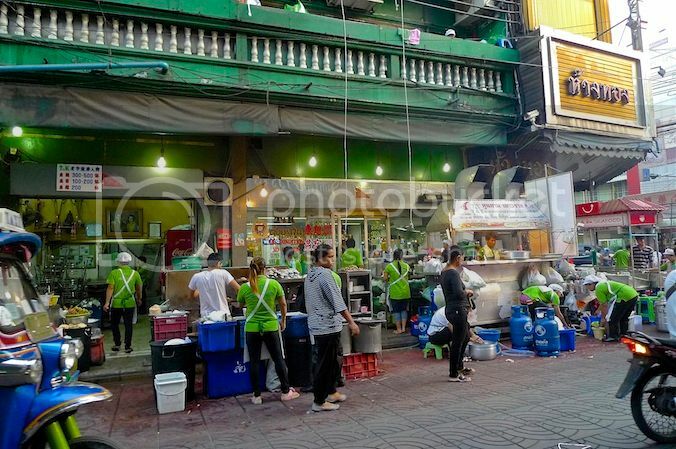 We were not aware of any other eateries around there, so we got back to the jetty in front of Wat Arun, took the boat and crossed the river to the Tha Tien Pier opposite. On the Tha Tien Pier opposite. Good bye, Wat Arun! 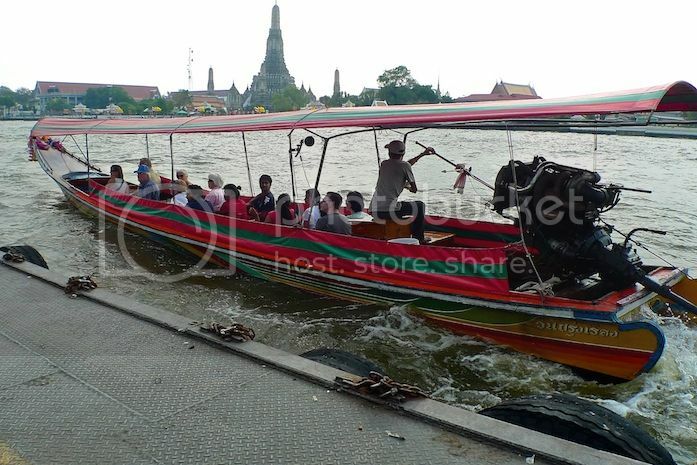 At the Tha Tien Pier, we took the orange flag boat to Ratchawong Pier or N5. From the pier, we walked up Ratchawong Road and turned right into Yaowarat Road. 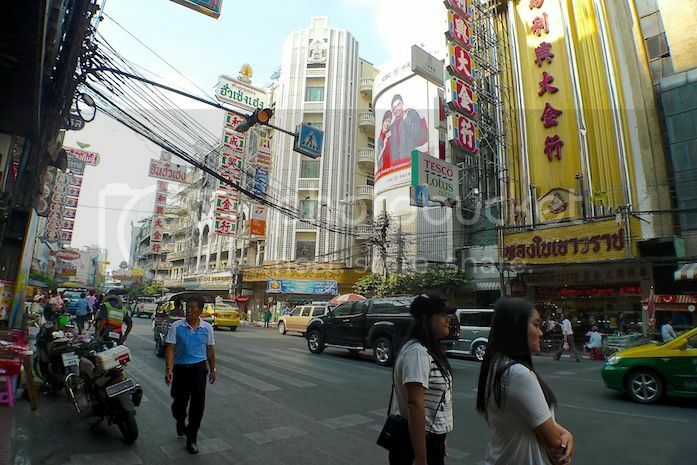 Yaowarat Road is actually a very long road in the heart of Bangkok's Chinatown. It's a very busy road indeed with shops and stalls lining up at both sides. 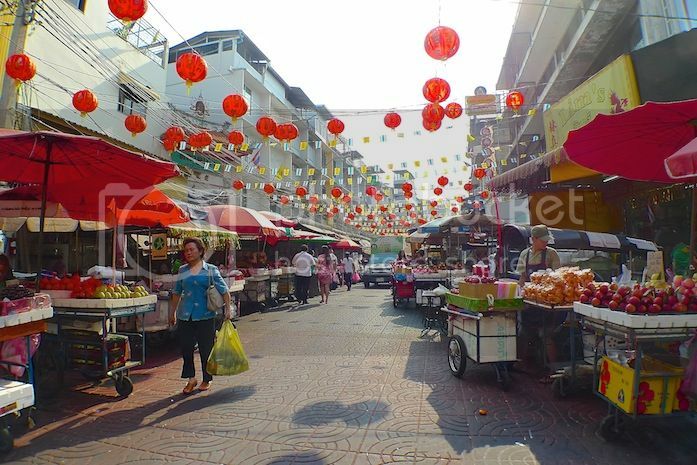 If you are uncertain of your whereabouts, the fruit stalls and the red lanterns are sure signs that you have arrived at Bangkok's Chinatown! 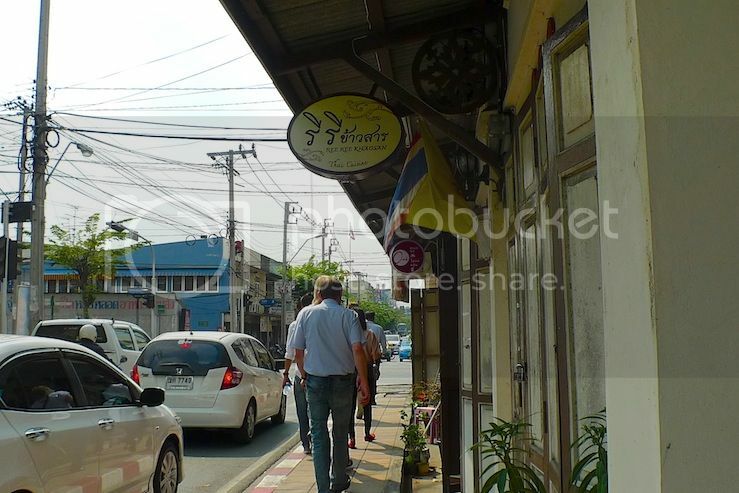 We walked quite some time along Yaowarat Road searching for the Double Dogs Tea Room. There were many people and it was quite hot. And then we saw it! YES!!! Hungry and thirsty, the sight of this air-conditioned cafe or tea room as they called it, was a huge welcome! Stepping inside, I immediately felt the respite from the heat and noise outside. The place was clean, and quite cosy. 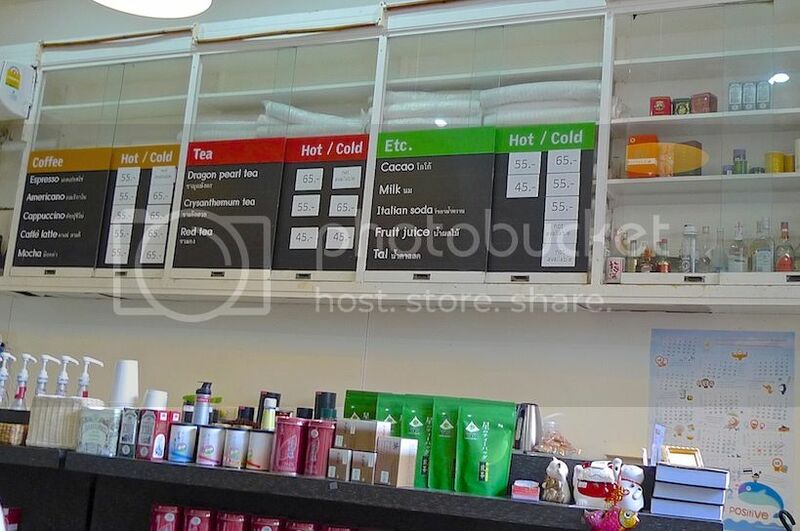 I took a look at the list of beverages behind the counter. 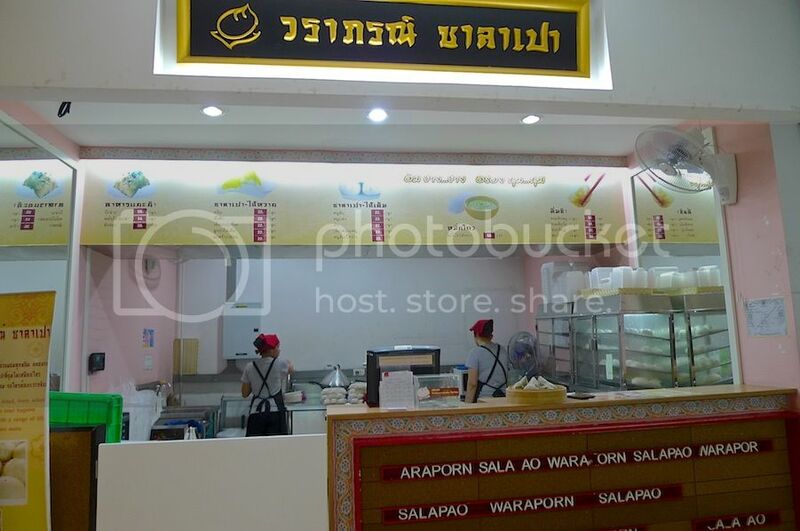 A cup of hot coffee for only 55 baht (US$1.75)? That's very reasonable! 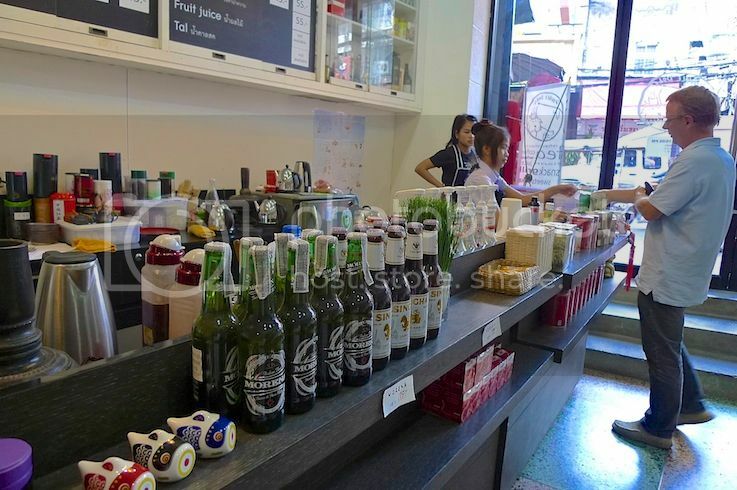 Despite priding themselves with serving fine selections of tea from China, Japan and Sri Lanka, the Double Dogs Tea Room also offers fruit juice, soda and beer. Ishmael and I made ourselves comfortable sitting at the table near the glass door so we could watch the world outside go by. I also noticed what looked like a small book shop at a corner of the shop here. 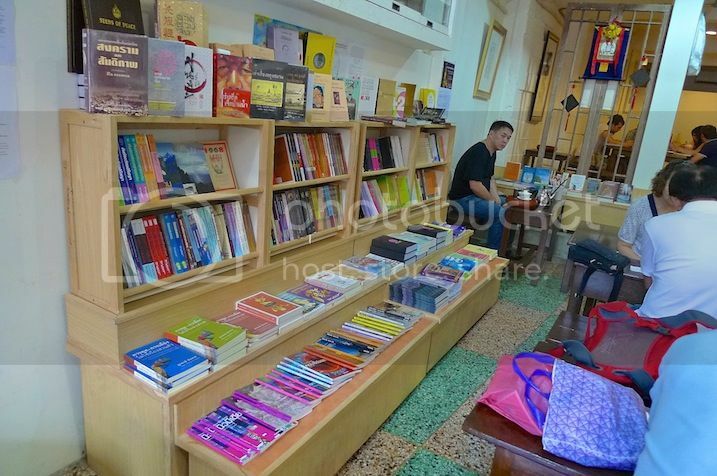 I went to check out the books and found them to be mostly inspiring books about Buddhism, about life and even about happiness. They were in Thai and English languages and some in Mandarin. Look at a book I picked up. See the title? Talk about Double Dogs! LOL!! OK, enough about the tea room. Let's talk about what did we eat and drink. 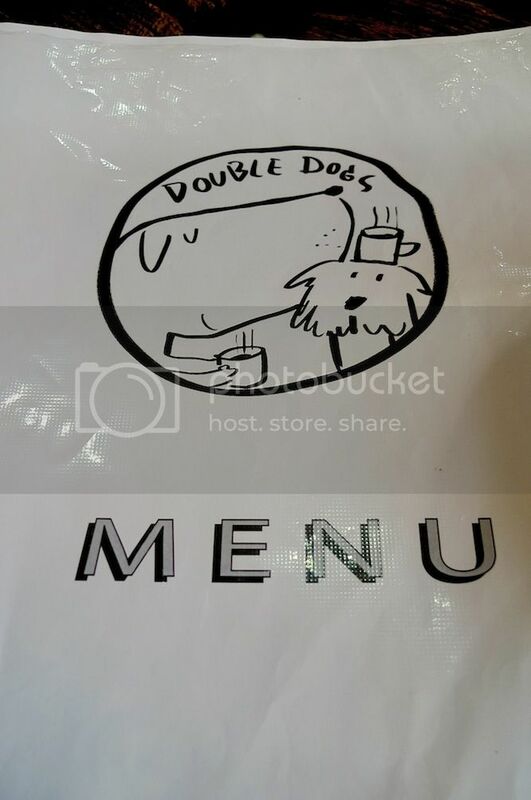 We flipped through the Double Dogs menu booklet. What? 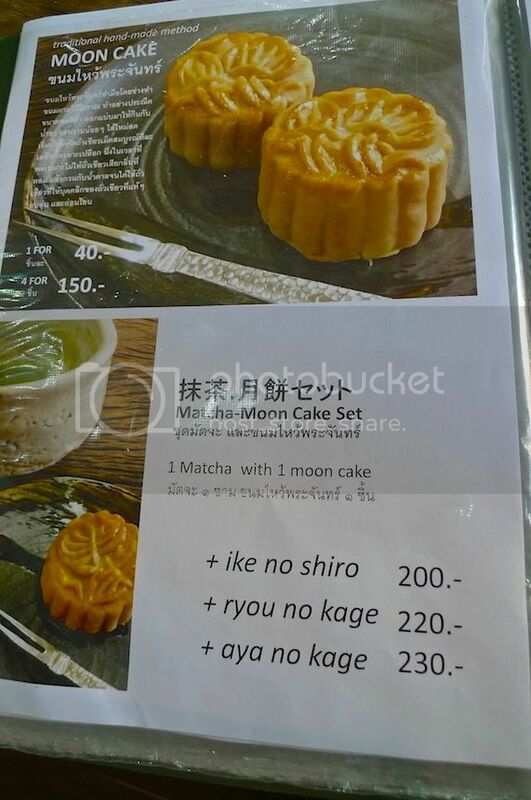 They sell moon cakes? 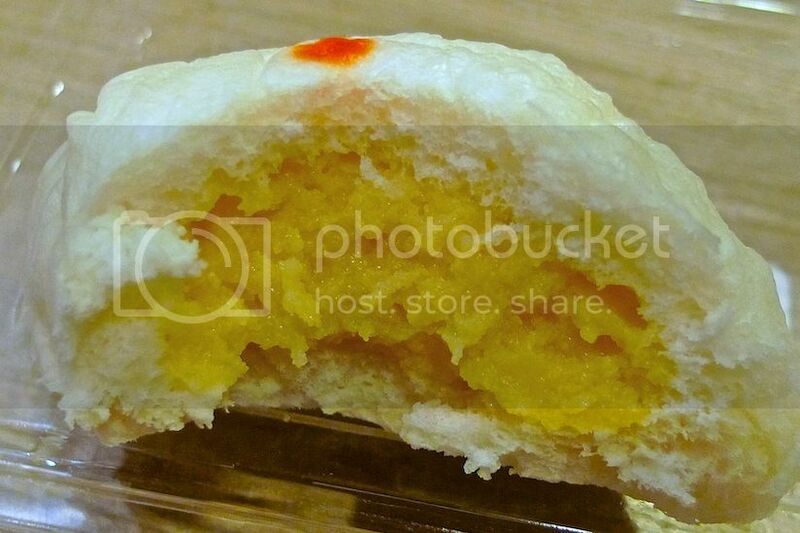 It's not even Moon Cake Festival at that time! Anyway, these were what we ordered. First, a glass of cold Bloodhound Beer for each of us. I guess we were just not in the mood for tea. 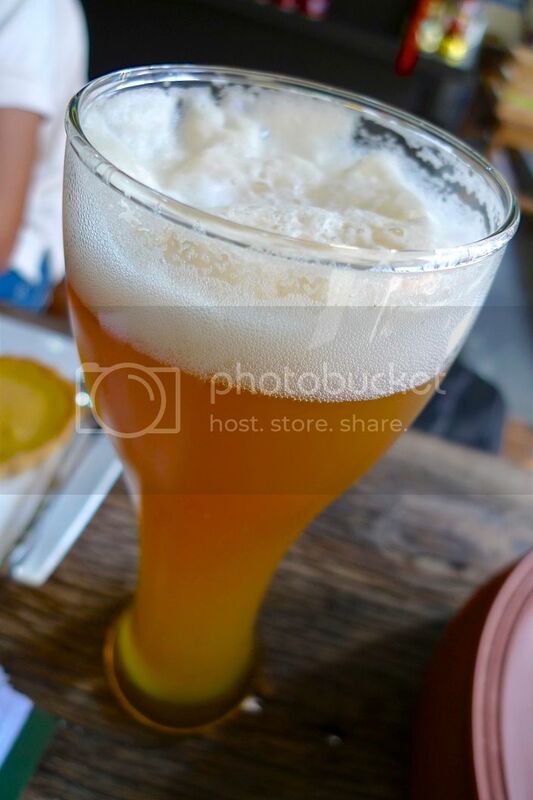 The menu stated this beer as "our beer-mixed that you find nowhere". Honestly, I did not find anything unique about this beer. It's just like any other beer out there. Perhaps I should try their tea next time. Having said that, the Bloodhound Beer was refreshing and provided me much comfort from the heat outside. 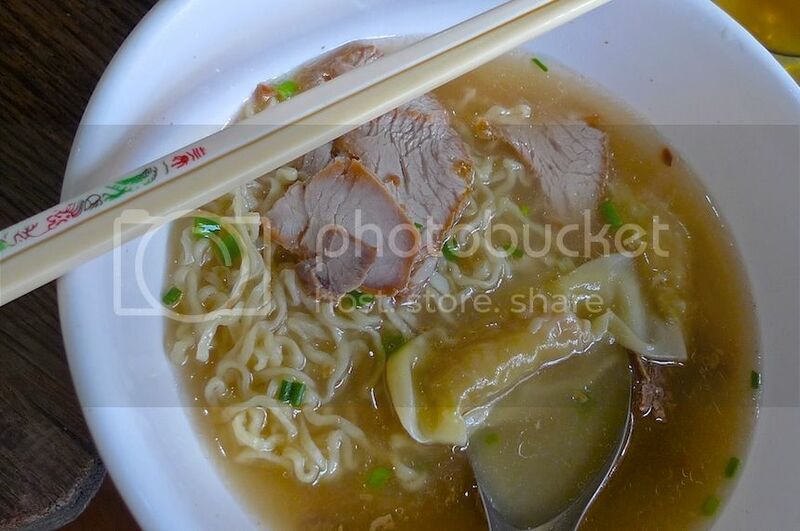 Next, we each ordered the Egg Noodle with shrimp wonton and barbecued pork. 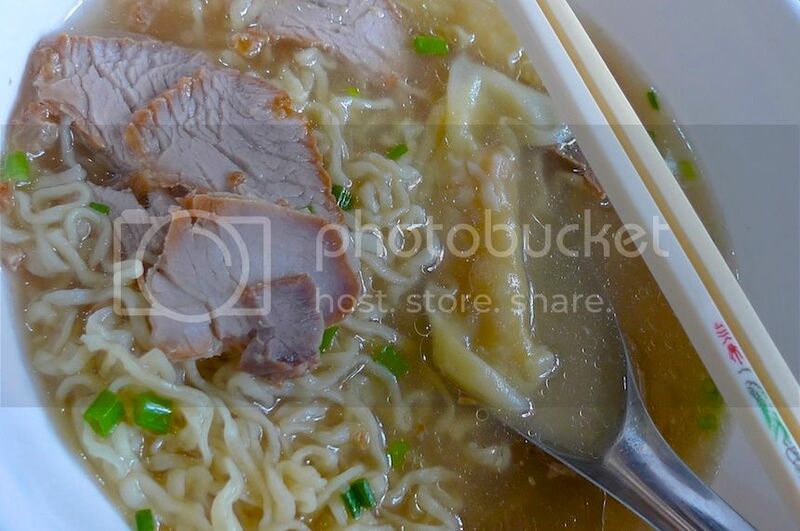 The egg noodle was not bad, but certainly not the best that I have tasted. With the main meal taken care of, it's time for some desserts! 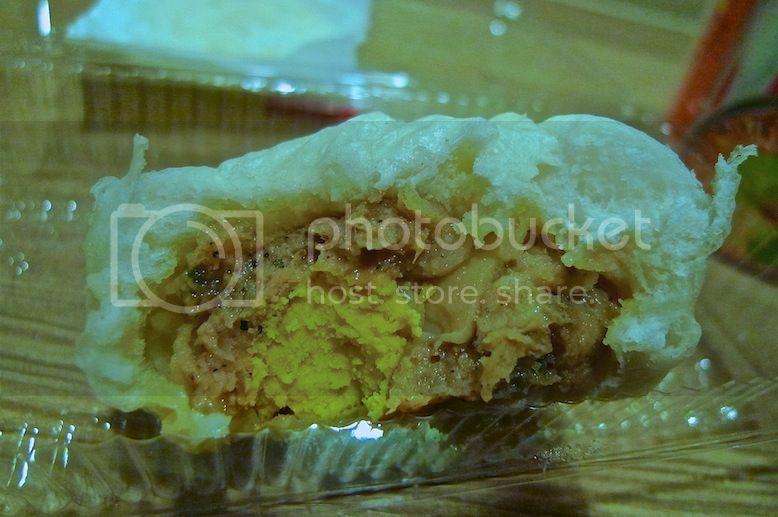 I was well aware that we just had sticky rice with durian at Boonsap Thai Desserts that morning but it was afternoon then and well, we needed to satisfy our sweet tooth haha! So we shared a home-made cake and a home-made Kulfi ice cream. 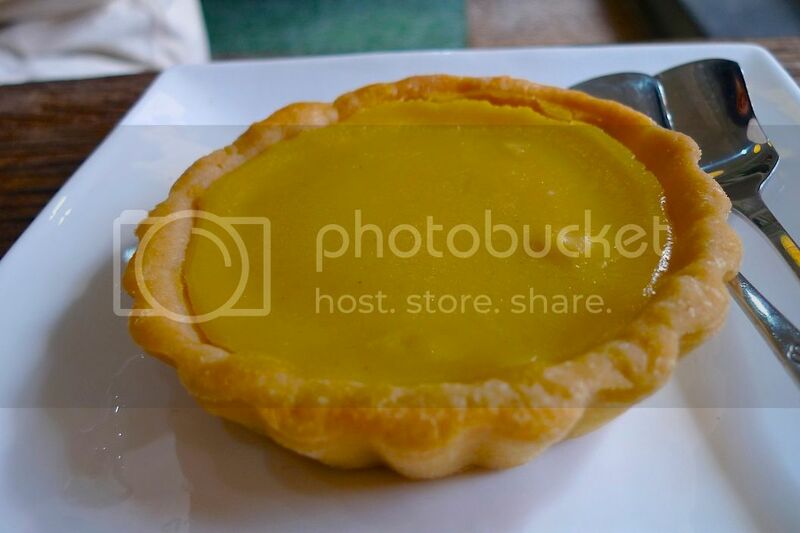 The cake is actually a lemon tart by the name of tarte au citron. It was yummy! Maybe I should have ordered the whole tart for myself LOL! I have to say however, that the home-made Kulfi ice cream was the best thing I had at Double Dogs! Made from fresh fruit, it had a very unique taste (I do not know how to describe it) and was very delicious!! There were actually 3 flavors to choose from - Tradition (ten spices and scent of Orient), Dance Of Orient (spices and 23 years aged Guatemala rhum), and Mixed Fruit. Both Dance Of Orient and Mixed Fruit contain alcohol. We chose Tradition. 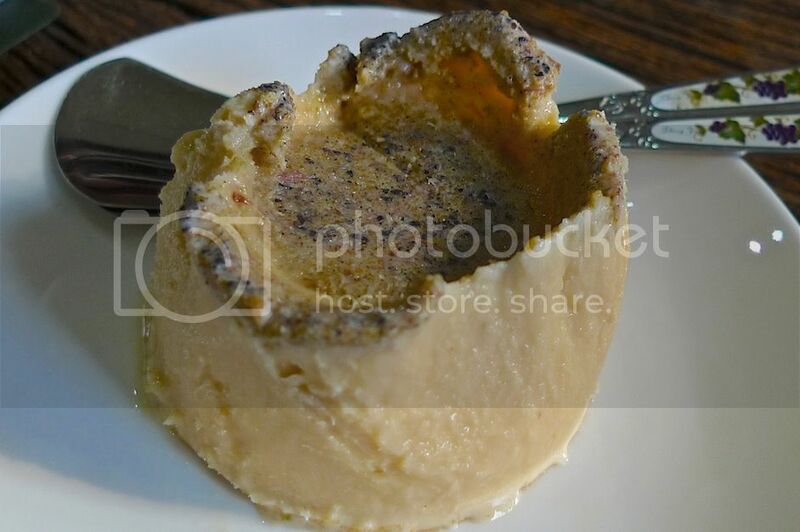 If I ever return here in future, I will definitely order this Kulfi ice cream again! And it will be all mine, definitely no sharing allowed! LOL! Ishmael and I spent some time here relaxing and chit chatting before deciding our next move, which was to walk around Chinatown. There was a handy map of Chinatown on the wall just next to our table, so I went to have a look. Can you see the location of Double Dogs? 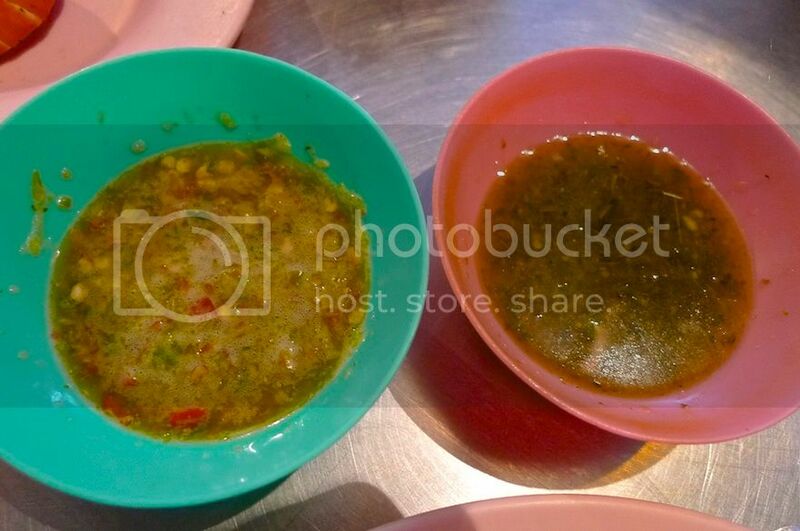 Our total bill came to 450 baht (US$14.25 / RM45.70) which was pretty reasonable. 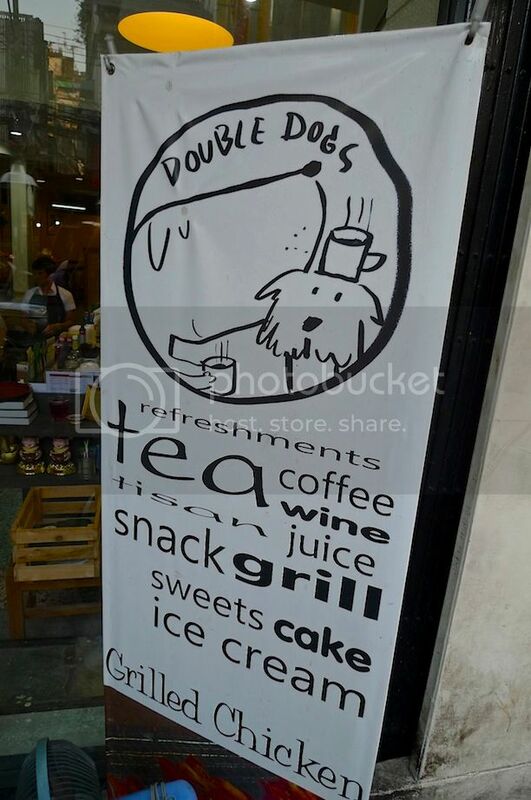 I have not been to enough cafes in Bangkok to say this, but I really think Double Dogs Tea Room is definitely one of the best! 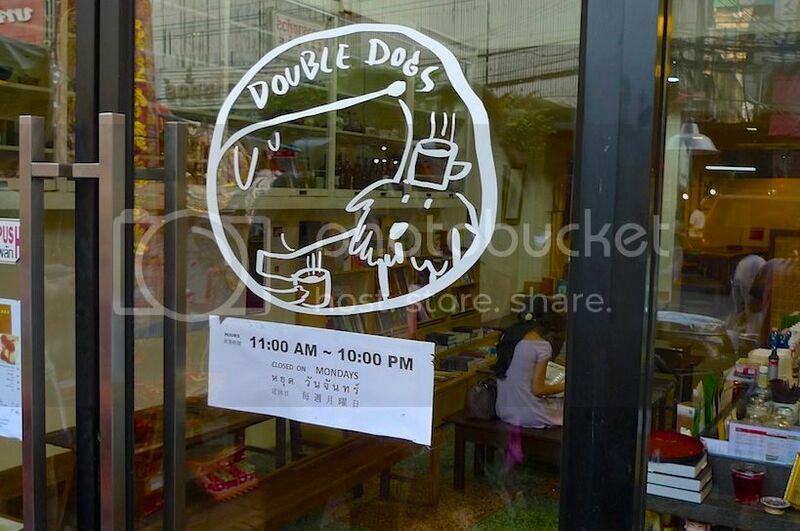 If you need a place to relax in the midst of the bustling street of Bangkok's Chinatown, Double Dogs Tea Room is your best bet! 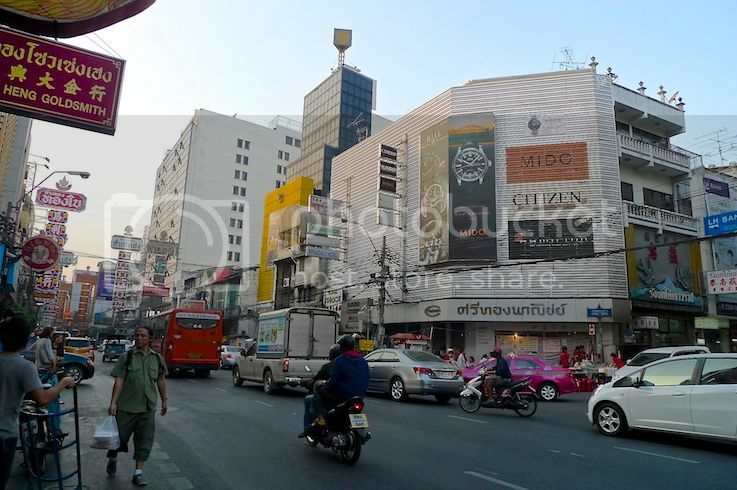 Directions : From Ratchawong Pier (N5), walk along Ratchawong Road, until you reach Yaowarat Road, turn right and walk for about 200 metres. Double Dogs Tea Room will be on your right.